This DIY (do it yourself) kit will allow you to put your bells on a black 19-bell fully lined, buckled strap. The strap is 1 1/2 inches wide and and about 89 inches (7 ft 5 in) long from the buckle at one end to the tip of the billet at the other. 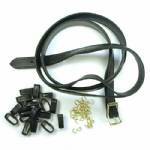 When buckled, this strap will make a loop from 79 to 84 inches around. The strap has a full leather lining, so the backside of this piece is a separate layer of smooth leather. The lining, buckle, and "keeper loops" are all stitched for durability. We make each sturdy bell strap from USA-tanned bridle leather and solid brass hardware. The buckle is stitched in place for durability and good looks. The strap will look best with medium to large bells that graduate in size. To learn more about the sizes of bells that look good on this strap, see this strap made up with our bells.